Back in January of 2016, I read the ARC of Nancy Bo Flood's Soldier Sister, Fly Home. I did not recommend it. I'm back today, with a review of the electronic copy of the book. Later in the story, we learn that Tess's dad is White, a Vietnam vet, and welcome at ceremonies. Flood is White. To tell this story, the publisher's website says that she "draws thoughtfully on her experience living for fifteen years in the Navajo Nation." As I read and compare the ARC I had in January with the electronic copy I have now, I see that Flood made some changes, maybe some that are based on my review in January. I noted, for example, her use of the word "ceremony" several times to describe the memorial Teshina (Tess) was going to attend for Lori Piestewa. A "ceremony" and a "memorial" are really different, so I'm glad Flood made those changes in the story. As the story opens, we learn that Tess is upset that her older sister, Gaby, enlisted in the army. Gaby had a future. She wanted to go to med school. Because she was a track star, she was planning on athletic scholarships to cover costs to go to college. But--she got thrown off her horse and broke her ankle. No more running, no more athletic scholarship, no college. She decides to enlist in the army. The thing is... in real life? Navajo Nation has scholarship monies. She could have applied for them. In the story, though, we're told that she didn't learn to read until junior high school, so maybe her grades aren't very good enough to apply for, say, the Chief Manuelito scholarship. But we also know that she wants to go to med school, which suggests she's doing well in the sciences. A small point, perhaps, to someone who doesn't know about scholarship monies that tribes have set up, but they're important. It scared me. Mom never cried like that. Tears at Lori’s memorial, but not many. Mom was always so Navajo about not showing much emotion. A moving scene? Maybe, but I read that bit about Navajo people not showing emotion as the stereotypical stoic Indian. It might sound good to readers who aren't Native, or aren't Navajo, but I ran that line by Navajo friends... Suffice it to say that they had pointed and amused responses to it. “I’m trying to figure it out, Tess, how to be me. Navajo? White? What’s me?" "Why did you sign up in the first place? Trying to be a war hero? Trying to be Navajo?" I am Navajo, Tess. Same as you!" "Wrong! We're mixed bloods, half-breeds. Misfits. Kids at school remind me every day." I've told you, Tess--ignore them. They'll stop." "It doesn't work that way for me. You're the gorgeous Navajo princess. I'm the kid who looks like a mixed-up mutt." The chapter ends with the fight over and Tess promising she'll take care of Gaby's horse. In return, Gaby promises to come home from Iraq, safe. The title for chapter seven is "protection ceremony" (lower case is the style used throughout the book). Tess's dad is outside chopping and stacking wood in exactly the way the medicine man told him to do it. She remembers other ceremonies, when people would sit cross legged with their backs against the walls of the hogan, facing the medicine man who sat in the center, "the place of honor." Tess tells us a few details of the ceremonies she's been to. I don't recount such things in my reviews because tribal nations generally protect those ceremonies from outsiders. I respect their decisions to keep such things private. "I even thought that maybe I wasn't a real Indian. Maybe not a real brother." There again, we have an identity question. In this case, it is a Navajo man thinking that his being scared might mean he couldn't be Indian. I guess he thinks he's supposed to be fearless. But that--like the Navajo mom who doesn't show emotion--is another stereotypical depiction. Obviously with that poem, Flood has the 13 year old character riffing off of the racist rhyme, Ten Little Indians, but why? Is it an attempt, by Flood, to recast that horrid rhyme? Is it necessary to do that? Is it necessary, for this story? As Tess and her grandmother go inside the trading post, Tess looks at her grandmother and thinks that she is as real as Indians can be, but wonders about herself. The two are there to sell a rug. Her grandmother is well known for her rugs. Does that, Tess wonders, maker her a real Indian? Mr. Snow extended his hand. They had agreed on a price. Grandma shook it once, gently, the Navajo way, like a real Indian. There may be protocols for the way that a Navajo woman would shake hands with a White man--or any man--but the use of "real Indian" here is jarring. It suggests there is a way that all Indians shake hands. I couldn’t believe what she did next. Sitting in front of the computer, wearing her velvet skirt, satin blouse, turquoise jewelry, and green sneakers, my real Indian shimá sání logged onto the internet as if she’d been doing it all her life. “Got mail,” she announced. If I had been holding a cup of coffee, I’d have dropped it. I get what Flood is trying to do, but this is kind of awkward. I think she means to make the point that Native people use the Internet. That scene might work if it was Rebecca (the white girl) making that observation, but it doesn't seem right, for Tess. I can imagine a Native kid being surprised at their grandma's technology skills... which makes the scene plausible, but here, it isn't working, for me, and it may be because it is a White writer doing this scene. Yá’át’ééh, Greetings, Hello Shimá Sání. That, too, strikes me as awkward. Native kids who speak their language and send email to their grandparents aren't likely to use a greeting in their own language, followed by, in this case, the word "Greetings" and "Hello." I might use a Tewa greeting followed by its translation in English, if I was talking to a White person, but to another Tewa speaker... that would be silly. Tess tells her about being called an apple "red on the outside, white in the middle" by the kids on the "Rez" (Flood uses a capital letter for R in rez) and "Indian princess, heap-big squaw" in school. She doesn't feel like she fits in with either group and asks her grandmother if it was like that when she went to school. Her grandmother tells her she was in boarding school. She tells Tess what it was like, and that she left without her diploma. When she got home, her parents saw how angry she was and arranged a Blessingway ceremony for her. The medicine man greeted her in English, which made her angry all over again. The medicine man told her that her Navajo and English fight, but that the ceremony will bring them together, and that both will be able to walk in her, with beauty. That passage gives me pause, because in a way, it feels to me like Flood herself is Becca. Becca is the white gaze. She is so interested in real Indians. Flood--through her character--is so invested in figuring out what a real Indian is. I'll be thinking about how this passage offers some parallel to what Flood is trying to do with her writing of Navajo stories. A few days later, Tess's grandma gives her some moccasins for an upcoming ceremony. The description feels off to me ("white doeskin with suede bottoms"). Several times, Tess dreams about Yé’ii, and as noted earlier, several times she talks about ceremony. All of this makes me uneasy, as does the many times when Tess, her sister, or her grandmother talk about how it isn't very Navajo to talk about death--and then do it anyway. It seems to me that in this story about a young girl wrestling with her half Navajo/half White identity, Flood is giving the world characters who flaunt Navajo teachings. The last line in the story is "All has become beauty again." For Tess, I suppose that is so, but using that 'beauty' reference to Navajo teachings bothers me. Those five words capture so much of what I find wrong with the book. Laden with ceremony and stereotypes.... it doesn't work, for me. In the Acknowledgements, Flood writes that Navajo elders and educators have reviewed the manuscript to ensure that her portrayals of culture and language are authentic, accurate, and sensitive. She goes on to say "Any inaccuracies are my own." I don't know what to make of that. If those elders found it to be authentic, accurate, and sensitive, why does she need the "any inaccuracies are my own" at all? She goes on to say that she lived and taught on the Navajo Nation for 15 years and that the story was inspired by her incredible Navajo students. She talks about all the things she did for them. I think she tells us all this so that we think she is a good person, helping Navajo youth. She doesn't have to do that. I believe we can all assume that she means well. Putting all that, and her desire to honor Lori Piestewa in the Acknowledgements isn't necessary. Today (September 1, 2016) I learned that Flood received a $2,000 award from the Society of Children's Book Writers and Illustrators (SCBWI) for this book. That is disappointing. In the Acknowledgements, she writes that the award is the Work-in-Progress multicultural one, which makes me all the more disappointed. I think of all the Native writers who SCBWI ought to be helping and wish one of them had been the recipient of this award. Writing about identity is hard. I don't think Flood pulled it off. I'd much prefer to read something by a Navajo writer, wouldn't you? To sum up: I do not recommend Nancy Bo Flood's Soldier Sister, Fly Home, published by Charlesbridge in 2016. Those who follow developments specific to depictions of Native and People of Color in children's and young adult literature know that A Birthday Cake for George Washington and When We Was Fierce were recalled days after or before their release dates. Another book is being recalled, days before its release. 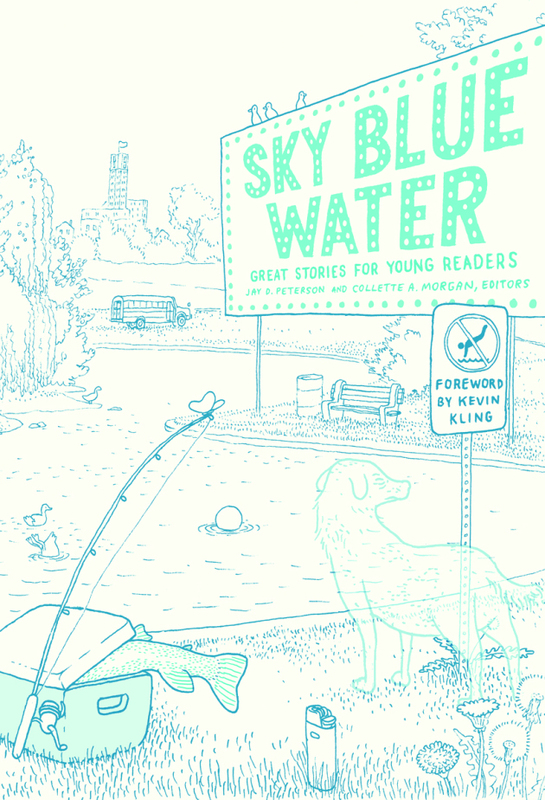 In this case, the book is Sky Blue Water. The error in it will be revised. The existing 4000 books are being recalled by the publisher. On August 28th, author Shannon Gibney, posted a photo of the page in the forthcoming Sky Blue Water that said "Christopher Columbus discovered America" on her Facebook page. She has a story in the book, which is comprised of several short stories for children in grades 4-7. Gibney wrote to the editors about that line and a few days later, the University of Minnesota Press (it is the publisher) decided to recall the book. It is not going away forever--which is good to know--because it has some terrific writers in it, including Marcie Rendon. She's an enrolled member of the White Earth Anishinaabe Nation. Marcie's story is "Worry and Wonder." It is about a child whose placement is being deliberated under the Indian Child Welfare Act. From the Boundary Waters you can canoe all the way to Hudson Bay. Some believe that the Vikings navigated from the Atlantic Ocean to Minnesota more than a hundred years before Christopher Columbus discovered the Americas. It’s possible we paddled the same waters, fought the same currents. That sentence is jarring. And yet, there it is.... uttered by Kling, and okayed by the editors... I think Kling and the editors are probably aghast with that line. How, they're probably wondering did it get there? Kling is probably wondering why he put those words in that foreword, and, the editors are wondering why they didn't notice them and ask him to revisit them. * Obviously, that line is so much a part of the American psyche that it gets said, written, and then, not heard and not seen by millions of people as a problem. An error. "In addition to the recall and reprint, we are going to examine how this error got by the editorial safeguards we have in place to prevent such inaccuracies from making their way into our published books," Hamilton said. Hamilton is the assistant director of marketing. University of Minnesota Press publishes some excellent books that I recommend to writers, editors, and book reviewers. Kim TallBear's Native American DNA and Jean O'Brian's First and Lasting are two examples. Books like this can help people learn things that aren't taught in schools--be that elementary school or a college classroom. Thanks, Shannon Gibney, for speaking up about that line. I think it is another example of the ways that social media can be used to effect change. I wonder what the revised Foreword will be? Will that line simply be cut? Or, will the editors use its appearance as an opportunity to tell readers about their collective blindness to the line in the first place? High profile writers have stories in the collection. Will they, in their speaking engagements, talk about that error? I hope so! Only by having a lot of discussion of the problem will we get to a place where errors like that won't happen again. 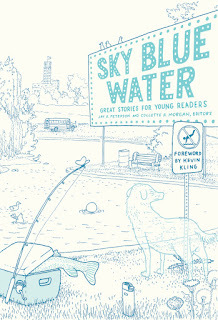 Sky Blue Water: Great Stories for Young Readers, edited by Jay D. Peterson and Collette A. Morgan, was scheduled for release on September 15th. The phrase "discovered the Americas" was introduced in editing and not written by Kevin Kling. It was introduced by an editor and was missed in review by the U of MN Press. She said they deeply regret that phrase, because it is inaccurate and out of step with the book. They are taking immediate steps to correct it. Want to support Mní Wičhóni Nakíčižiŋ Owáyawa (Defenders of the Sacred Water School)? On Monday, August 29, 2016, I wrote about the Standing Rock Sioux and the actions they are taking to protect water. Thousands of Native people are gathering there, standing with them. Over one hundred other Native Nations and organizations have issued letters of support of Standing Rock. Although most of what you see in the news is adults, there are children there, too. On Monday, people at the camp opened a school for the children. They named it Mní Wičhóni Nakíčižiŋ Owáyawa, which means Defenders of the Sacred Water School. Among the Facebook pages that you should read to keep up with the school is that of Alayna Lee Eagle Shield. Below are links to her public posts. She is posting many photos, but please do not repost her photos without permission. Because her posts are public, I believe you can share them on your own pages, but please ask permission to use the photos. August 29, 2016: A series of photos of the kids at the school, taken on Monday August 28. Note that it includes a list of supplies they need, but they've since received some of that and are working on a new list. August 30, 2016 at 8:56 PM: More photos, and, an overview of Tuesday's activities that demonstrate this is an Indigenous gathering of people. Maori people are there, too. The children of the school were able to welcome the totem pole that arrived there yesterday from the Lummi Nation. 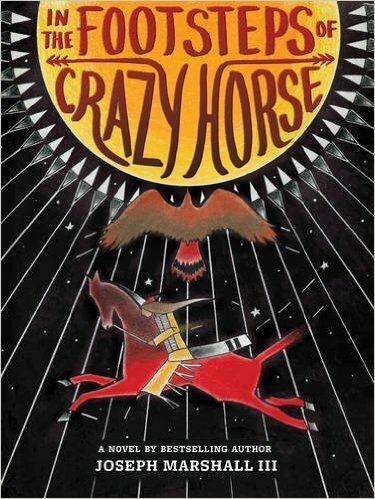 This morning I had email with Joseph Marshall III, author of the outstanding In the Footsteps of Crazy Horse. He has been at the camp and will return there. He's taking copies of his book to the school and will ask about sending other books. For now, here's an option: The Standing Rock Sioux tribe's website has a link to donate to their work if you want to do that. And if you're on Facebook, you can get updates on the Standing Rock Nation's page. If You Care about American Indians... Keep abreast of Native news. It is a spectacular sight: thousands of Indians camped on the banks of the Cannonball River, on the edge of the Standing Rock Sioux Reservation in North Dakota. Our elders of the Seven Council Fires, as the Oceti Sakowin, or Great Sioux Nation, is known, sit in deliberation and prayer, awaiting a federal court decision on whether construction of a $3.7 billion oil pipeline from the Bakken region to Southern Illinois will be halted. The decision to say 'no' to the Dakota Access Pipeline is one that matters for Native people and for anyone whose health will be at risk when that proposed pipeline leaks. As the people who are gathering there and elsewhere are saying, this is about water. We all need it. The people of Standing Rock are taking action to protect their rights, and everyone's water. With each day, I see resolutions from tribal councils who declare that they stand with Standing Rock. I'm also starting to see resolutions from entities that aren't Native. You may have friends, or your children may have friends, who aren't where you are in terms of knowing that we're part of today's society. Far too many people think we no longer exist, and far too many think that if we wear jeans and drive cars, then, we aren't "real" Indians. They don't know what "real" Indians are! American citizens don't dress like George or Martha Washington, but that doesn't mean we aren't "real" Americans. Somehow, there's this idea out there that if we don't live and dress exactly like our ancestors did, we can't possibly be "real" Indians. That's bogus. There's also this idea out there that Native people have high cheekbones. Or glossy black hair. Dark eyes. That's not accurate, either! I hope you'll follow the news and tell others to follow it, too, but I also want you to make sure that the books you give to your children and students are ones that don't frame us in narrow, stereotypical ways. Check out, for example, this response from elders and leaders, to a story at the New York Times that was clearly biased. 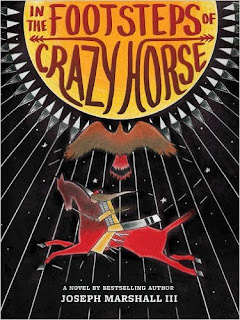 If you want to get your child or students a book that accurately depicts someone of the Great Sioux Nation, pick up Joseph Marshall's In the Footsteps of Crazy Horse. The main character in the story is a blue-eyed Lakota boy, on a road trip with his grandfather. It's a winner.